We had an unreasonably long trip to Mbale: we flew Boston to Frankfurt, and after 16 hours in the Frankfurt lounge (thank heaven for lounges! ), we continued on to Addis Ababa and then to Entebbe. 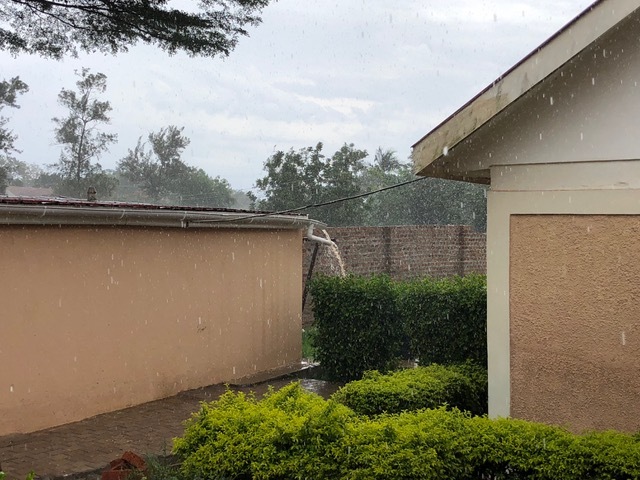 By the time we drove the final leg of the journey, 7 hours over very bumpy, slow roads from Entebbe to Mbale, we had been en route for 45 hours. Thankfully, all the flights were undersubscribed, allowing us to stretch out over 3 seats each on the longest leg, and our time in the lovely lounge gave us a Sabbath-like day in which we rested, relaxed, and caught up on some quiet activities like emails. As a result, we weren’t as tired as we should’ve been given such a long journey. We were thrilled to be back in Uganda. Since 2012, we hadn’t missed a year of spending a couple of weeks in this beautiful country with these precious people—until 2018, so it was extra special to be back. Mackay and Doreen met us Thursday, April 4, and saw us safely to Mbale, where we settled in at the Mt. Elgon Hotel for the next six nights. Mackay and Doreen, flanking Paul, and Julius, the driver, got us safely to Mbale from the airport in Entebbe. We hit the road running, wanting to maximize the few days we would have there. First event: LivingStone International University (LIU) to speak to students and faculty/staff on relationships. Organized by Dr. Martha Wright, head of the Education department, she was uncertain about how many would come from 3 to 6 on a Friday afternoon with the weekend already underway, and was pleasantly surprised with the group of about 45 who showed up to talk about things Ugandans typically don’t talk about. The group was eager and interactive, and in response to the question, “What qualities and characteristics should be present in a suitable marriage partner?,” their list was almost identical to every list we’ve gathered everywhere we’ve done this. Such an affirmation of the universality of the human nature of image bearers! We were delighted to have had this interaction with college students. Top left photo, we’re having lunch with Dr. Martha Wright, prior to speaking at LivingStone International University. The next two photos are during our Friday afternoon session with them, and the last photo is of our evening with a small group of couples. ﻿Straight from LIU, we went to the home of Dr. “Emma” Emmanuel (pediatric neurosurgeon at CURE Hospital) and Florence to spend the evening with their small group of couples. We fell in love with Dr. Emma and Florence last month at the CURE President’s weekend, and were so happy to be in their home with their friends. After a typical Ugandan feast, we spent a couple of hours talking about marriage matters with a very sharp group who raised some great questions. Not surprisingly, there is such a common thread that runs through many of the marriage challenges around the world. It was a lovely evening. 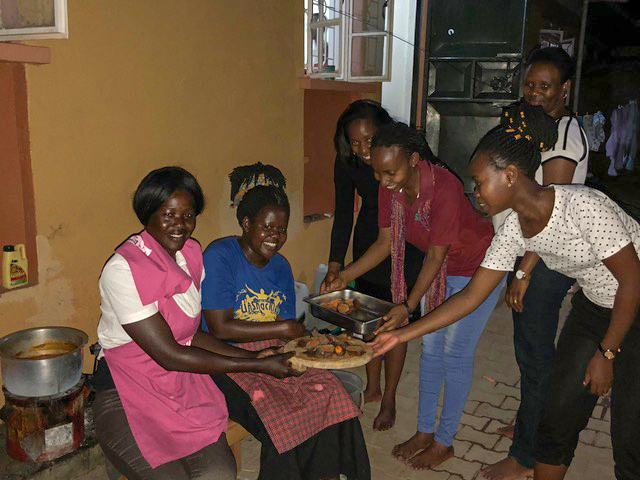 Rachel, one of the cooks from CURE, prepared a feast for the couples who gathered at Dr. Emma and Florence’s home. After a good night sleep, we had an early start Saturday for an all-day pastor’s training conference for a group of church plants on Wanale. Wanale is the mountain that backdrops Mbale and is filled with tribal villages. By now, 11 Baptist churches have been planted on the mountain through JENGA and the pastors and staff of those churches were invited to this unusual-for-them event. They came from far and wide, arriving between 9:30 and 11, eventually swelling to a crowd of about 50. Overall, though they were poorly educated and very poor, they were rich in their hearts for Jesus and we had a great day together. Thankfully we had a lively interpreter in Pastor Andrew, who has pastored on the mountain for 11 years. Traditional breakfast (bananas and hard boiled eggs) and lunch (matooke, rice, and beans) were served and fares for “boda boda” lifts were given to each attendee. We are so grateful that the board of H.I.M. is committed to having H.I.M. underwrite these ministry outreaches, which would not happen otherwise. 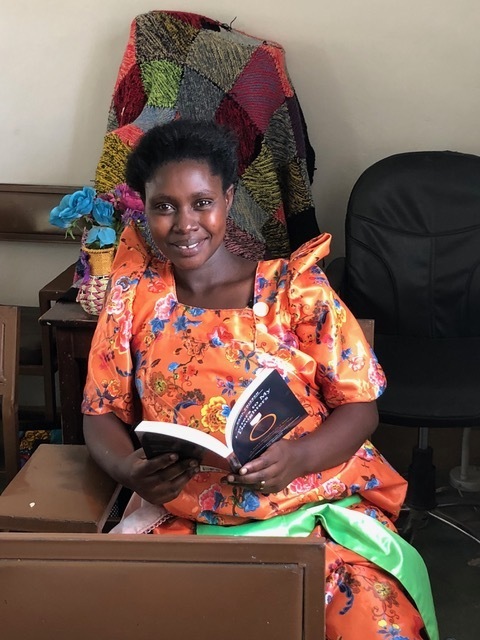 The first Baptist church planted in Wanale 11 years ago was the site for this all-day conference, and pastors and staff came from all over the mountain to take advantage of this free training. Pastor Andrew interprets as we speak, but this littlest attendee was not interested in what anyone was saying at this point. Pastor Andrew and his wife Sarah hosted the day, with help from several others. 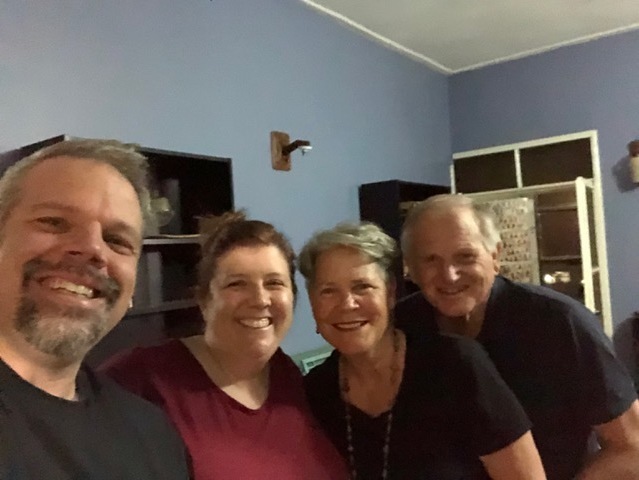 The day ended with a lovely evening spent with JP and Jill Robinson, who are wrapping up 7 years of ministry in Mbale as they return to the States this May. We’ve so enjoyed both a friendship and ministry partnership with them all these years and will truly miss them on future trips. This is the only photo we got with JP and Jill . . . maybe you have to be under 40 to get a good selfie? ﻿The Sabbath arrived and we were so honored to fill the pulpit for both services at Pearl Haven Christian Church (PHCC), pastored by Wilberforce and Sarah Okumu. We love them! They are such an inspiration to us as they lead PHCC with passion, vision, and fully surrendered hearts for Jesus. It was a special joy to worship in their recently dedicated church building, the completion of which has been a long time coming. The H.I.M. 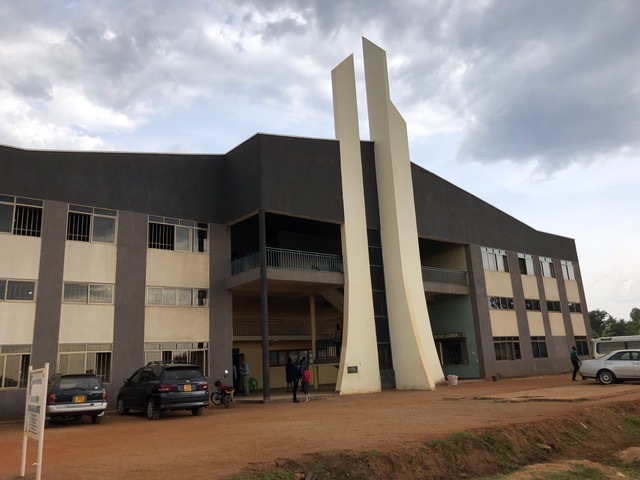 family made a sizable donation several years ago towards the roofing of this very large church (which can accommodate over 1,000 people) and Wilberforce mentioned again how much our partnership means to them. Since the church was dedicated in July 2018, attendance has increased from 500 to 700. They are driven by gospel values and desperately want to proclaim the hope of Jesus to the tens of thousands of people within a couple mile radius of the new building. The completed building that houses Pearl Haven Christian Church. Worship is always a highlight at Pearl Haven. The sanctuary continued to fill as the morning went on. Some of the CURE family whose home church is Pearl Haven. We returned to Pearl Haven from 4 to 6 for a couples’ event and a surprising number of folks returned to take advantage of both teaching and the opportunity for Q and A. Patrick and Winnie, who lead the family and marriage ministry at PHCC, organized this event and were very pleased with it. 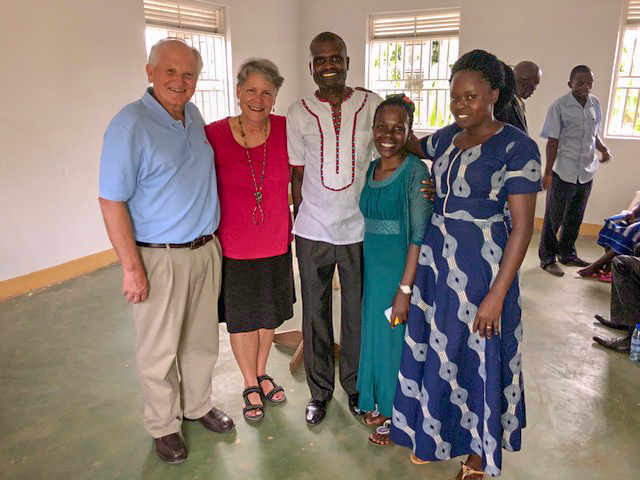 Wilberforce and Sarah and Patrick and Winnie provide Christ-centered leadership for Pearl Haven. A large number returned for the marriage seminar from 4 to 6 pm. In between the church services and the couples event, we did a couple of hours of counseling, so by the time we returned to the hotel around 7:30 pm, we were too tired to get dinner. A Clif bar and fruit were consumed in our room and we were both very asleep by 9. Monday morning we finally got to go to our favorite place in Mbale: the CURE Children’s Hospital. We spoke at chapel from 8 to 9 am and were teary-eyed as we reunited with many of our dear friends. It is in our favor that those who were at the hospital during Derek and Julie's tenure love them so much. We are treated with deep love and respect, which we have in return for them. Amazingly, we spoke from Hebrews 12, “Finishing the race” and with no prior knowledge that one of the Spiritual Care Team had written that exact verse on the community white board as the verse of the day. Only God . 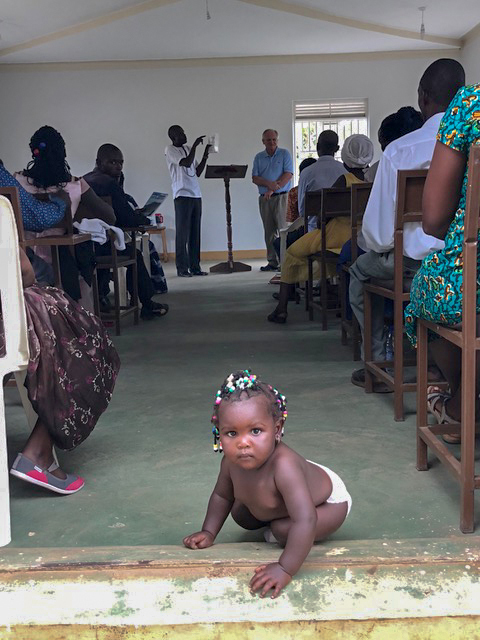 . .
After chapel, we spent not long enough visiting mamas and babies in the ward and were again so moved by the loving care and level of professionality each family unit is served with. Talk about the hands and feet of Jesus . . . these servant-hearted staff do it well. It was a privilege to pray with several of the mamas whose babies were scheduled for surgery that day. 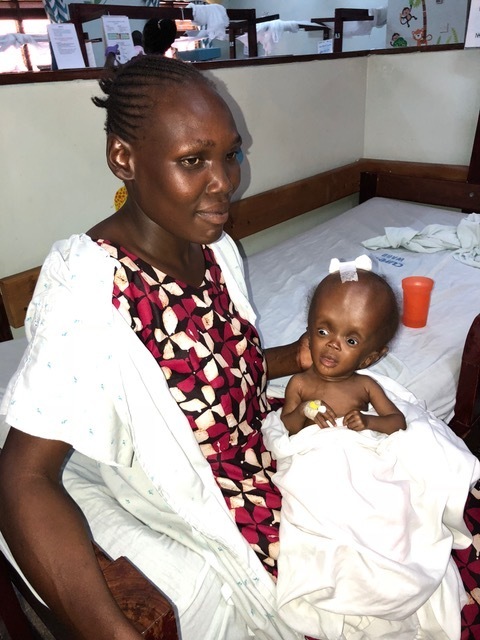 It is so hard to see these little ones; some have such advanced cases of hydrocephalus because of their delayed arrival to the hospital. Even so, intervention will be done at whatever point they come and they have hope for a much better life as a result. Many of them meet Christ during their stay at the hospital. Only God . . . Arriving at CURE Children’s Hospital and reuniting with some of our dear friends. More of our dear friends . . . This sweet mama’s baby has had surgery and is on the way home today. This one also has already had surgery, which will hopefully arrest the growth of her head. ﻿Reluctantly we left the hospital, but happily stepped into another all-day pastors’ training with a new group of Mbale pastors. They were very grateful for the day, and we could do twice the amount of teaching we did Saturday because we didn’t have to speak through an interpreter. Many of the pastors and their wives who came Monday to the all-day seminar. We literally left the pastors’ conference at 4:30 and continued our day back at Dr. Emma and Florence’s home for a Single Ladies night. Florence has just taken over leadership of this group and decided that having us speak on relationships would set the course for the next several months. This is our “jam” and we were really excited about the potential. Florence had no idea of how many would come, but brought 50 chairs from church to set under a temporary tent in their yard. She had dinner prepared for 50 and we brought a case of Letters to my Daughters to gift each attendee with. And they came. And came! When all the church chairs were full, all of the house chairs were enlisted, and those were filled as well. They listened, interacted, asked questions, and fully engaged. They smiled, laughed, and even a few tears were shed. When we announced the book give-away at the end, they were ecstatic. Florence distributed them, marking each name off of the attendance list, and when all was said and done, each lady had a book…and there were no more to give. A case holds 64 books, and a few had been given earlier. Exact amount. Only God. Beautiful Florence prepares to serve dinner to the women who attended the special evening. The meeting was held in their yard, under a tent. We loved being with this group. The gals were so excited to get Paul’s book and many of them hung around for him to personalize their copy. ﻿Tuesday early we returned to CURE Hospital and spent two hours counseling hospital employees. We saw 7 people in 2 hours; we called it “TED Counseling.” They put the schedule together and we just went with it. No time for background info or “getting to know you,” but God seemed to use it. Only God could!! Our last seminar was for a group of leaders from JENGA, an NGO founded and operated by Robby Keen, a man from the UK with an unquenchable heart for the Lord. Since we have met with JENGA leaders multiple times through the years, Robby asked them what they wanted us to address, and the top four ended up being extended family relationships, finances, parenting, and sexuality. All such easy-to-deal-with subjects!! We didn’t exactly exhaust all four, but we gave it our best shot given the time limitation. There was a lot of laughter and good interaction throughout the day. We love to partner with Robby and JENGA. Midway through the day, our voices were drowned out and the electricity was snuffed out by a period of torrential rain. YES!! We jubilantly praised God for this answer to prayer. It was a beautiful sight and sound! Thankfully, the rains have continued. Inside the seminar room, a group of JENGA employees were very engaged in the all-day seminar dealing with family issues. A welcomed interruption to the day: RAIN!! Hard and fast. Thank you, Jesus! Most of those who attended JENGA’s all day “family matters” seminar. We were so grateful to return to the hotel in time to take a walk before meeting up with a young couple with whom we’d spent time earlier in the week. We loved chatting with them about love and marriage and Jesus and really hope our paths cross again in the future. The final capstone to our time was catching up with Moses and Rita-Rose over dinner. These dear friends have both served CURE Hospital for many years and have become very dear friends. We were so thankful for this opportunity to be with them. Dinner together with Moses and Rita-Rose Kitunge was lovely. And then it was time to leave. Too soon. An early morning walk to the rising of the sun was a sweet farewell. Off we went to Entebbe, across those bumpy, sometimes unpaved, often congested roads and eight hours later we were at the airport. 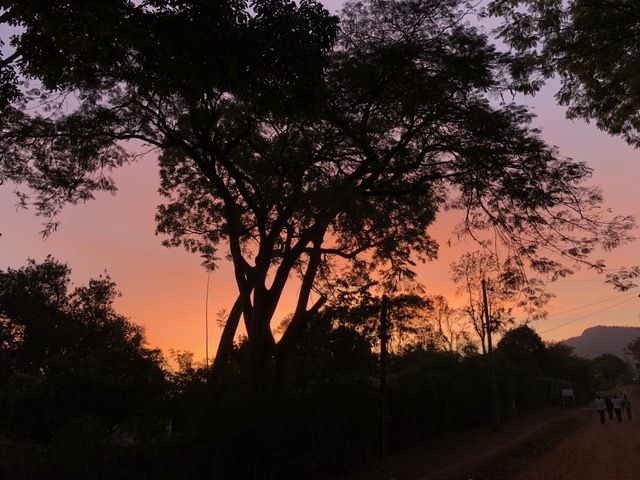 Thirty-three hours after take-off, with stops in Addis Ababa and Frankfurt, we landed at Boston Logan with hearts full of gratitude, memories, and awe as we considered the many “only God” moments we had experienced in this “short but so sweet” trip to Uganda. Some of the scenes we passed on the road from Mbale to Entebbe.